India plans to try out several upgrades of its largest rocket during a test flight Thursday, including using a new indigenous cryogenic third stage to insert an experimental communications satellite into orbit. The Geosynchronous Satellite Launch Vehicle will lift off from the Second Launch Pad at the Satish Dhawan Space Center at 1057 GMT (6:57 a.m. EDT) Thursday. 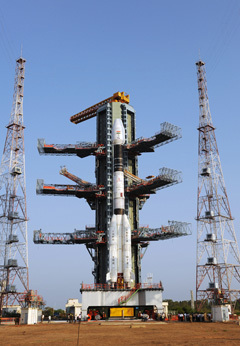 It will be 4:27 p.m. local time at the launch site, which is located at Sriharikota Island along India's east coast. The payload for the sixth GSLV launch is the GSAT 4 satellite, an all-purpose spacecraft with communications and navigation instruments. But most attention on the launch will focus on the debut of a new Indian-built hydrogen-fueled third stage. Indian space officials deem the flight the most-reviewed launch in the history of the country's burgeoning space program. The all-Indian rocket rolled to the launch pad last week. The GSLV stands about 161 feet tall and weighs more than 900,000 pounds at liftoff, according to the Indian Space Research Organization. The centerpiece of Thursday's test flight is the GSLV's third stage, a creation designed and built by Indian engineers that is about 15 years in the making. Other new components flying for the first time Thursday include a larger payload shroud and advanced telemetry and computer systems, according to ISRO. Propellant tanks made of aluminum alloy inside the 28-foot-long third stage will hold more than 28,000 pounds of super cold liquid hydrogen and liquid oxygen. The cryogenic engine will burn for nearly 12 minutes, producing a peak thrust of more than 16,000 pounds. During five previous launches of the GSLV, the booster flew with a Russian third stage also fueled by liquid hydrogen and liquid oxygen. 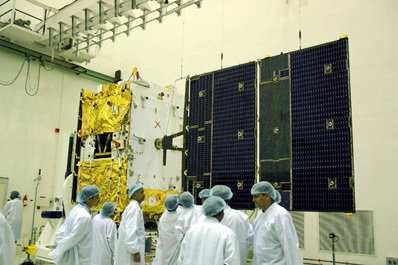 The Russian stage reportedly shut down early during the last GSLV flight in 2007, leaving a communications satellite in a lower-than-planned orbit. Because of international technology transfer agreements, Russia was able to sell only ready-made cryogenic upper stages to India, forcing the GSLV to rely on foreign hardware until India could develop its own design. Hydrogen-fueled rockets are more efficient than other propulsion systems. 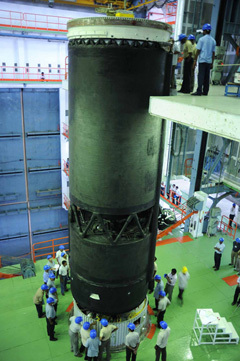 "Cryogenic stage is technically a very complex system compared to solid or Earth-storable liquid propellant stages due to the use of propellants at extremely low temperatures and the associated thermal and structural problems," said an ISRO fact sheet. The new third stage engine includes new turbopumps running at 39,000 rpm to flow 36 pounds of propellant into the engine's combustion chamber every second. Before the third stage can ignite, the GSLV will be propelled to an altitude of 83 miles by a powerful first stage motor and flight-proven liquid-fueled engines. An unusual design feature of the GSLV is its first stage propulsion system, which includes a solid-fueled core stage and four liquid-fueled strap-on boosters. Most rockets are powered by a liquid-fueled first stage and smaller solid rocket boosters. Four Vikas engines clustered around the bottom of the rocket will ignite less than five seconds before liftoff. Computers will monitor the performance of the engines before commanding the solid-fueled first stage to ignite at liftoff. Packing 1.7 million pounds of thrust, the four booster engines and first stage motor will power the rocket during the first two-and-a-half minutes of flight. Another liquid-fueled Vikas engine on the GSLV second stage will fire for more than two minutes to set up for the Indian-built third stage's burn. The timeline calls for the third stage engine to turn off at T+plus 16 minutes, 47 seconds. GSAT 4 will be deployed about 15 seconds later, according to ISRO. The GSLV will release the spacecraft in an egg-shaped transfer orbit with a high point around 22,000 miles. GSAT 4's on-board thrusters will circularize its orbit at an altitude of 22,300 miles in the coming weeks. The satellite will be stationed along the equator at 82 degrees east longitude in continous view of India. Four high-tech plasma thrusters on GSAT 4 will help keep the satellite at its prescribed position in space during its seven-year mission. The 4,894-pound satellite carries a regenerative Ka-band transponder with several key new technologies enabling more efficient communications, increased capacity and higher flexibility. ISRO officials say applications for the Ka-band technology includes multimedia services and high-bandwidth Internet. GSAT 4's navigation payload, called GAGAN, will augment signals from the U.S. Global Positioning System constellation for the Indian aviation industry. GAGAN will provide more accurate and reliable navigation data over Indian territory, according to ISRO. An Israeli astronomy instrument named TAUVEX was originally supposed to be hosted by GSAT 4, but the telescope was removed from the satellite earlier this year. Indian officials have not stated an official reason for the sensor's late removal, but Israeli scientists say TAUVEX was taken off the satellite to save weight due to concerns about the GSLV third stage's lift capability.